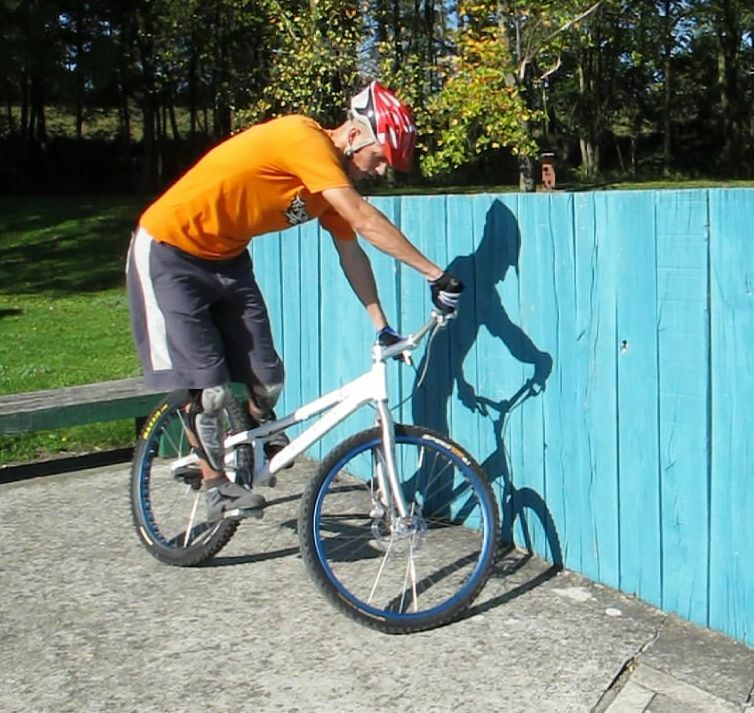 In biketrial, the trackstand is the invisible technique that gives trials riders their stability when concentrating for a move. The whole purpose of the trackstand is to secure yourself in a stable position so that you can look around, breath, or rest your arms, while staying on the bike even in the middle of a zone. Vincent Hermance lodges his front wheel into a recess. There is the free trackstand before zone entry, and the locked trackstand with the front wheel pushing against an obstacle in the zone. As you progress in trials riding, the trackstand will become your default mode, securing stability and preparing for the next big move. The whole balancing act relies on adjusting your center of gravity (moving your waist) on one side of the bike, while you lean the bike onto the other side in a counter-balance measure. Move your hips away from the bar turn. Practise riding up a slight slope. 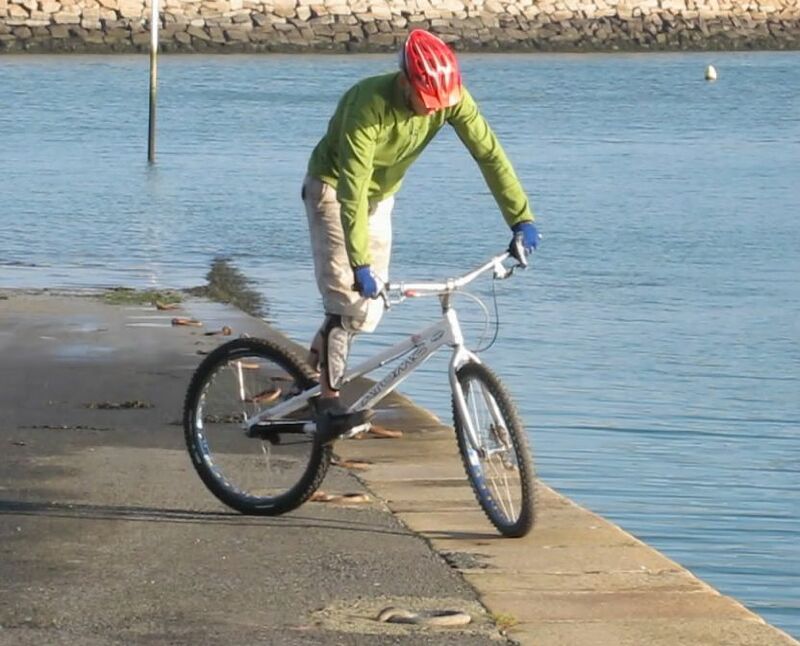 If you lose balance on the side you turned the bars, turn the bars a bit more towards the slope, leaning the front wheel more into the slope while shifting your weight in the opposite direction. If you lose balance on the side of your driving foot, try to lean more over the bike, tucking your knees over the frame. Practise by riding up a slight slope at an approximate angle of 45°, reduce your pace until the bike actually stops. 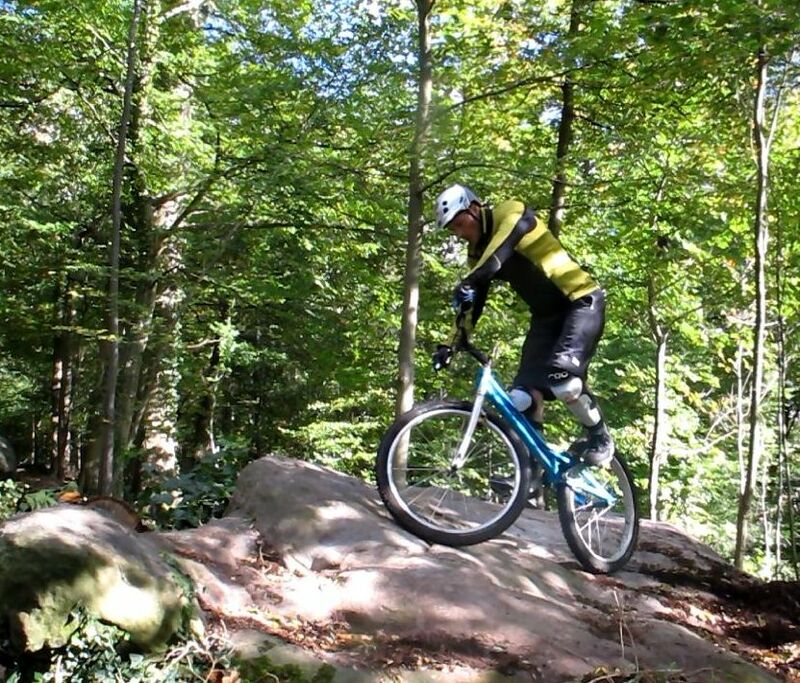 Turn the bars up against the slope and keep some pressure on your strong foot to stop the bike from going backwards. You'll note that if you release your driving foot progressively, the bike will force its way backwards, turning the cranks backwards too. Try to play with this, going up or down as you put more or less pressure on your front pedal to keep your balance with these small back and forth adjustments. 1° Ride up a slope very slowly at an approximate angle of 45°, reduce your pace until the bike actually stops. 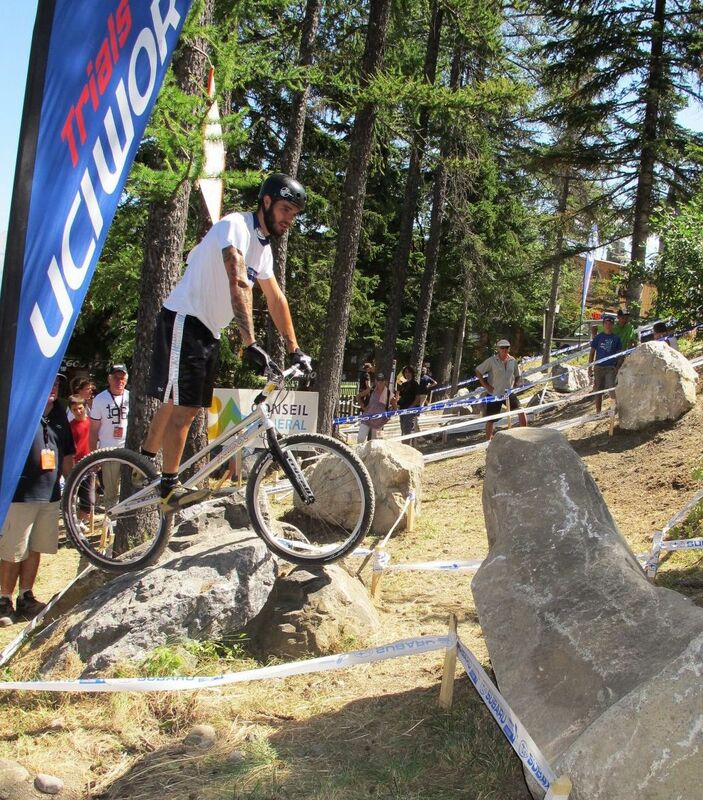 2° Turn the bars up against the slope and keep some pressure on your strong foot to stop the bike from going backwards. 3° Lean well over the handlebars and shift your hips away from the front wheel, realigning your body to face the front wheel direction. 4° If you lose balance on the inside of the turn, then turn more, leaning the bike a bit more into the slope, pushing yourself away from the frame. 5° If you lose balance on the opposite side of the turn, then straighten the bars and readjust your centre of gravity to lean nearer the top tube, tucking your knees over it. 6° Once you have stopped the off-balance movement to a standstill, try to find a comfortable middle position where you don't have to stretch or tuck too much. 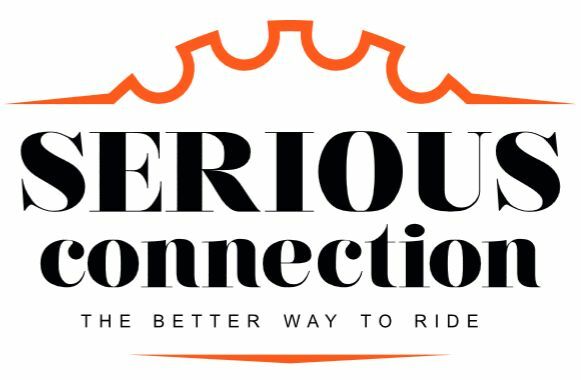 Without a slope, you will have to use the brakes to a full stop, use the front brake to stabilize the bike, then decide a direction in which to turn the bars. If you turn the handlebars to the left, lean on the right side of the top tube (this is usually the easiest trackstand position for riders with the right foot forward). With both brakes locked, you'll realise that you have two solid points of contact with the ground. Then you must constantly adjust your position to find the perfect balance over the line between these two points of contact. The more you turn the bars, the more movement you have to counter-balance and lean on the other side (the front tyre contact on the ground moves as you roll the wheel, even when the brakes are locked). Lean up against the slope to secure some support. Don't face down the slope, the front wheel rolls too easily. With practise, you'll be able to maintain a trackstand turning the bars in any direction, change your front foot, and even change from one trackstand position to the opposite in order to get the best angle and support from the ground. 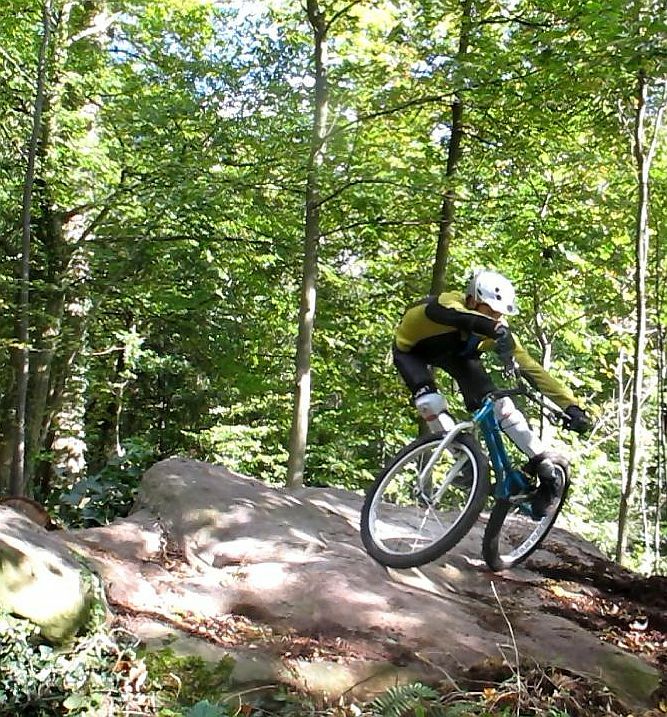 As a preference, if you are balancing onto a sloppy obstacle, always try to balance across the slope, with your bars turned up against the slope. This gives you the most support when leaning over the front wheel. The other side offer nearly no support (the front tyre rolls down too easily and you can't stretch enough to counter balance properly).